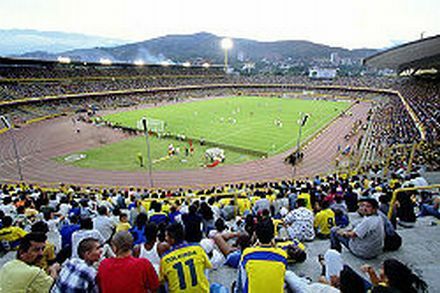 The Pascual Guerrero Stadium, Cali, was the home ground for both America and Deportivo Cali. One evening in the early 1990s my son Ned and I found a free table at Pascualitos café in the centre of Cali, awaiting the ‘classico’. It was hot and humid evening and the café, right across the street from the Pascual Guerrero Stadium, was doing good business. The café was run by true brothers. The elder brother served us cold drinks, telling us that America were to once more overcome their local adversary Deportivo Cali (typically referred to as ‘Cali’). The younger brother would hardly have agreed, being a Cali fan. The evidence of the split in the family was plain to see as the walls of the little café were adorned with both the red of the ‘Diablos Rojos’ of America and the green of the ‘Azucareros’ of Cali. We sat there for half an hour, listening to the tango music that they invariably played there, watching supporters bedecked in green or red, passing by. There was a carnival atmosphere and not a hint of trouble as the rival supporters intermingled. There was talk that Cali’s controversial new coach, Jorge Luis Pinto, was going to bring back the glory days to the club. The previous decade had seen a shift in power within the city and Cali had not won a championship, being beaten three times in the final of the playoffs by America. America had started to dominate the Colombian league and had reached three Copa Libertadores finals. The volatile Pinto was not a universally popular appointment for Cali fans at the time. He had never played professional football and had started out as a fitness coach for Millionarios in Bogota. Following a sojourn in Brazil he joined the coaching staff of Union Magdalena, in the town of Santa Marta on Colombia’s Caribbean coast. Pinto was then to embark on a degree course in Cologne, Germany. His dedication to professional advancement was to pay dividends for him in 1984 when he returned to Millionarios as their Director Tecnico (DT), head coach. He was to also become DT at the other big Bogota team, Santa Fe, and at his old club, Union Magdalena, before arriving in Cali. Pinto had inherited a difficult situation at Cali. It was a big old club on its way down, but the fans maintained their expectations for the kind of football they had seen during the reign of that most elegant of Colombian midfield players, Carlos Valderrama. Under the influence of Pinto, Cali were to become more physically competitive, but were to lack the class of previous teams that had worn the green jersey. They could not overcome the stranglehold of their city rivals. Pinto lasted a year before moving on. Over the 20 years since leaving Cali, Pinto was to become the ultimate journeyman, changing his job 14 times. Returning to previous clubs has been his forte. Following his departure from Cali he went back to Santa Fe, then back to Union Magdalena. He was national coach for both Costa Rica in 2004-05 and Colombia in 2007-08. Given his previous pattern it was no surprise that he came back to lead the Costa Rica national team in 2011. 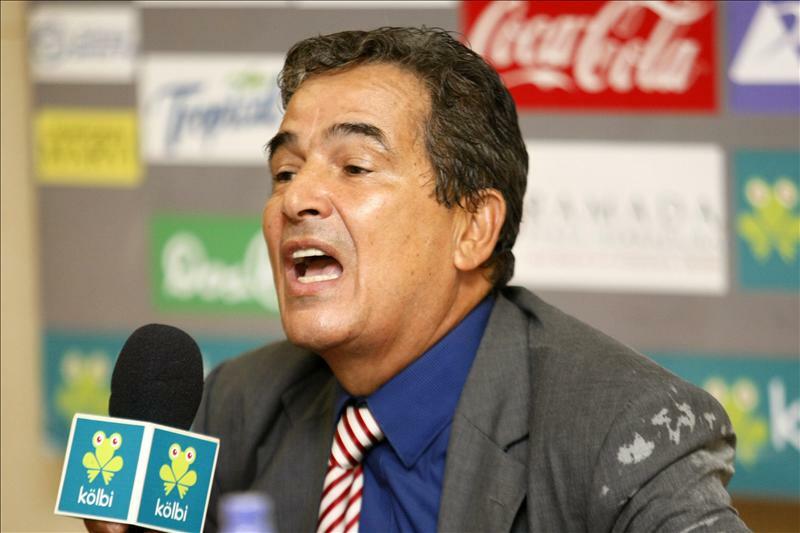 Gabriel Ochoa Uribe, manager of the highly successful America side of the 1990s, once said that Pinto has one obvious weakness: his personality. There is no doubt that Pinto is a prickly character to deal with. However, his travels and studies have left him with a wealth of football knowledge in his head. Costa Rica have been the surprise team in the current World Cup. Pinto has welded together a group of players who play for unfashionable clubs in Europe and the Americas into a highly organized outfit, showing no mean level of skill. Playing a back line of three central defenders they play a high pressing game which stymies their opponents. To play at such a tempo makes physical demands on the players but given Pinto’s background we can expect his team to be as fit as any in the competition. On Sunday Costa Rica play Greece in the knockout phase. Can the Central American team continue to punch above its weight under the guidance of its colourful coach? Only time will tell. But while Pinto could not produce miracles a couple of decades ago at Cali, he has shown he can come close to doing so on a world stage. His tactics have been spot-on up to this point and it will be interesting to see if he tweaks them in the Greece game. His side have won a lot of support from neutral fans and deservedly so. They will continue to be backed by a strong Tico contingent who have made the journey to the south. That crowd support could make a difference in what is going to be a tense affair in the steaming heat of Recife. Pinto is in his third year as coach of Costa Rica, equaling the longest stay he has had anywhere during his turbulent career. The 61 year old Colombian, who stands at 5’5”, has come so far over these years. To win a group containing the likes of England, Italy and Uruguay was beyond belief, but can he now take it a stage further?